James Dyson is well known for his out of the box thinking and equally ‘out there’ designs. His stable of innovative vacuum cleaners, fans and hand dryers is testimony to what can happen when you go back to first principles and re-imagine the rest. So what would happen if the British superbrain turned his mind to airline seating? 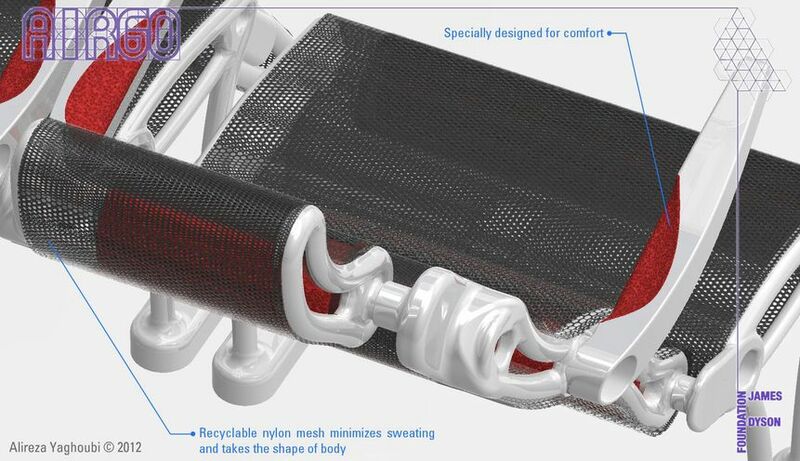 It could be something like this – the AirGo economy seat, a winner of the 2012 international James Dyson Award. 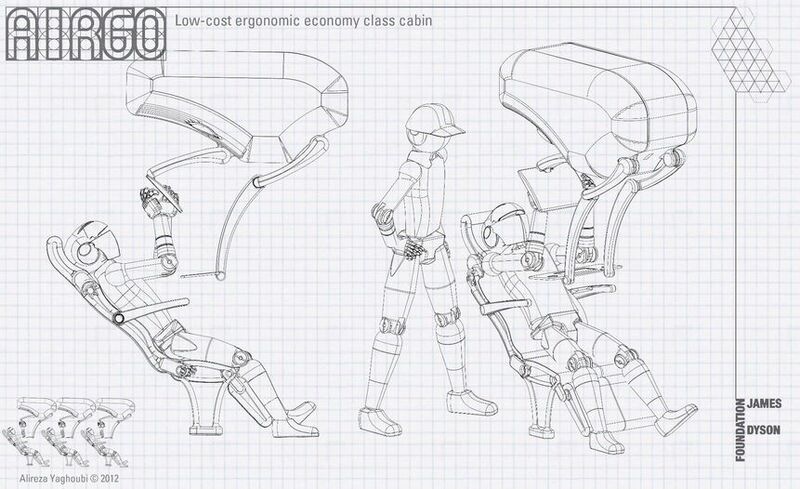 Described as “a low-cost yet highly ergonomic approach to economy class cabin design”, the AirGo seat looks like something out of a cutting edge science-fiction film – we’re thinking 2001: A Space Odyssey meets Alien. 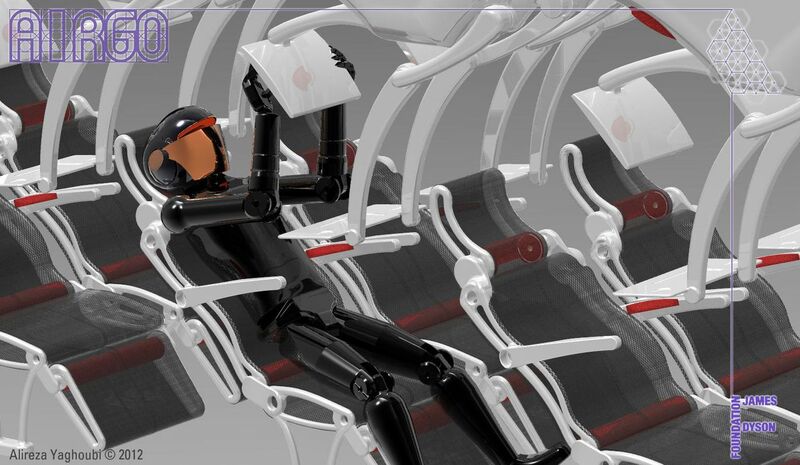 “While the design is minimal and economically viable, the problem with reclining seats is addressed by designing an independent space for each row of seats” explains the AirGo’s creator, Malaysia-based engineering student Alireza Yaghoubi. We should note that Yaghoubi appears to be using ‘first class’ in the domestic American sense, which we know as business class. 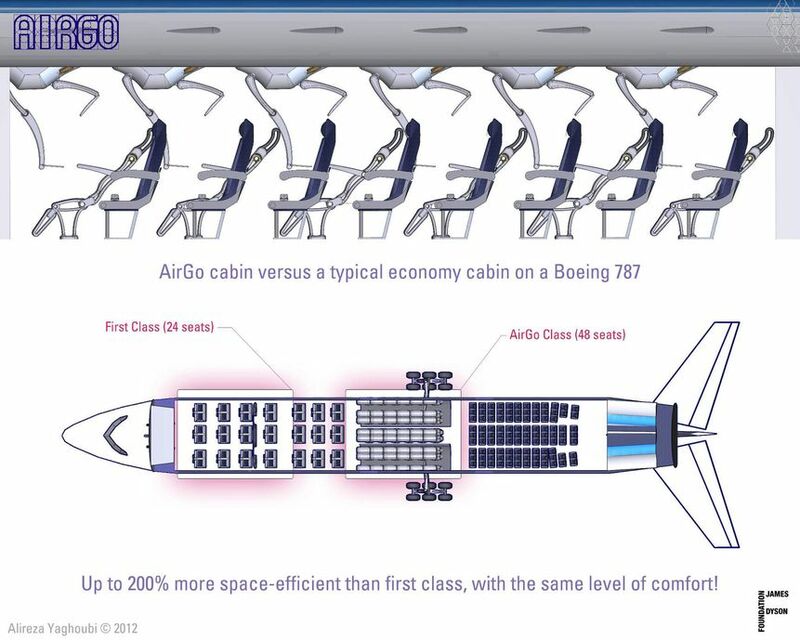 The AirGo is a radical and surprisingly minimalist deconstruction of not just the economy seat but the whole cabin. It comprises two parts: the seat itself, and an individual overhead luggage locker for each passenger (rather than a shared bin). 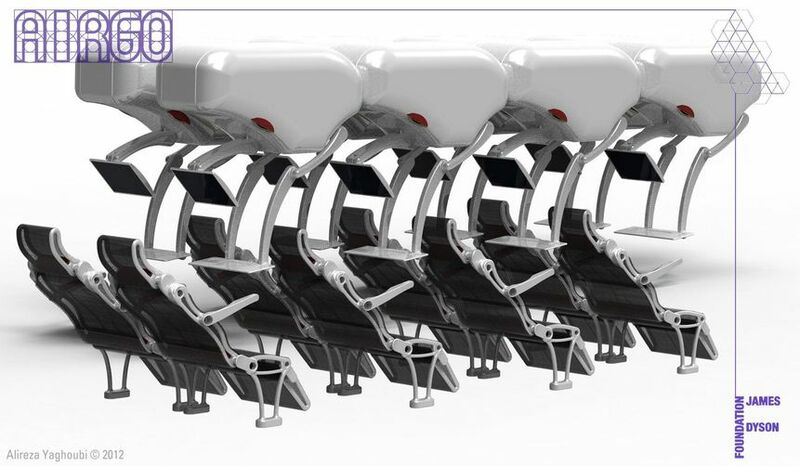 The seat module consists of an articulated frame containing three motors that allow the passenger to customise its position for maximum comfort and minimum back pain. There's an inbuilt touchscreen display, of course, for adjusting your seat as well as enjoying inflight entertainment. 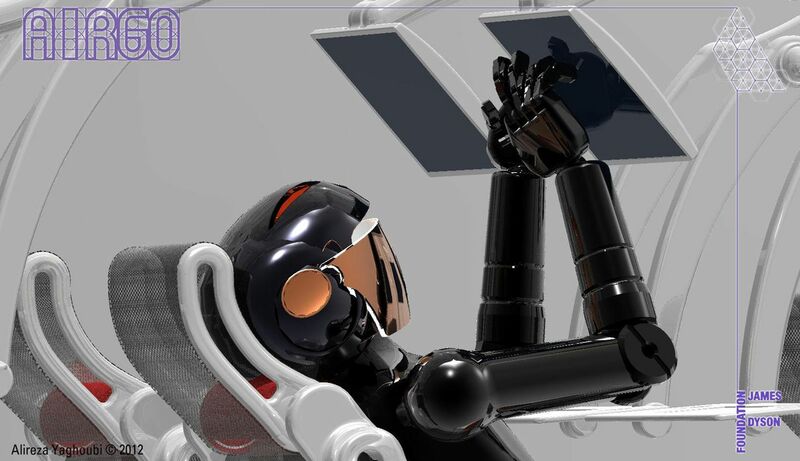 Both the screen and tray table are mounted independently on arms that can be easily moved or simply folded away when not wanted. The back support is made of strong yet flexible nylon mesh which adjusts to the shape of your body to avoid fatigue, and also prevents sweating. Keeping the seat clean "is as easy as replacing this recyclable net", Yaghoubi says. 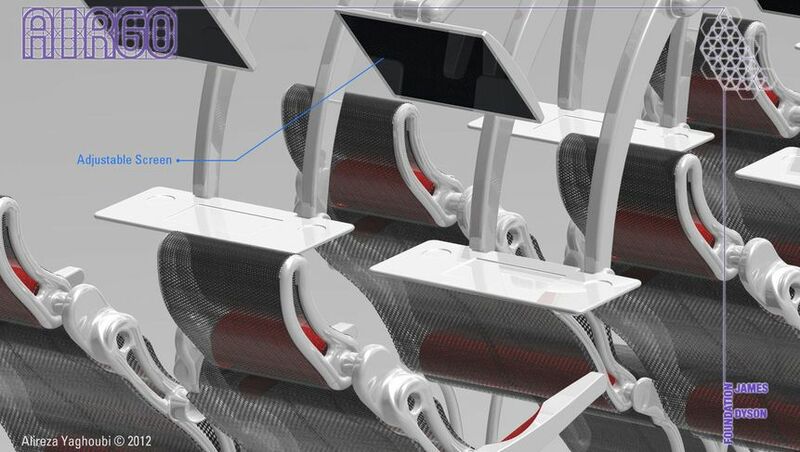 Yaghoubi claims the AirGo seat would not only be cheaper to manufacture and maintain than today’s economy designs, but that it’s ”200% more space efficient than first class” and only needs 16% more space than a conventional economy seat. Fitted on an Airbus A380, Yaghoubi suggests another radical departure from the norm: the seat layout would be 1-2-2-2-1. That's right: four aisles, with no more than two seats next to one another. What's your take on the AirGo economy seat – would you be willing to fly this all the way to New York or London? Share your comments below! Get live updates on the latest news for business travellers and frequent flyers: follow @AusBT on Twitter. I couldn't deal with this product. It looks very much like it would make a claustrophobic of me and frankly, I don't like the mesh on the seats. Like, at all. Of course you would, but this is a substitute for an economy seat, not a first-class suite. The article makes clear that the reference is to US domestic first-class. I think he should stick to vacuums. Looks fantastic to me. Would solve many of the physical constraints of economy class seating. 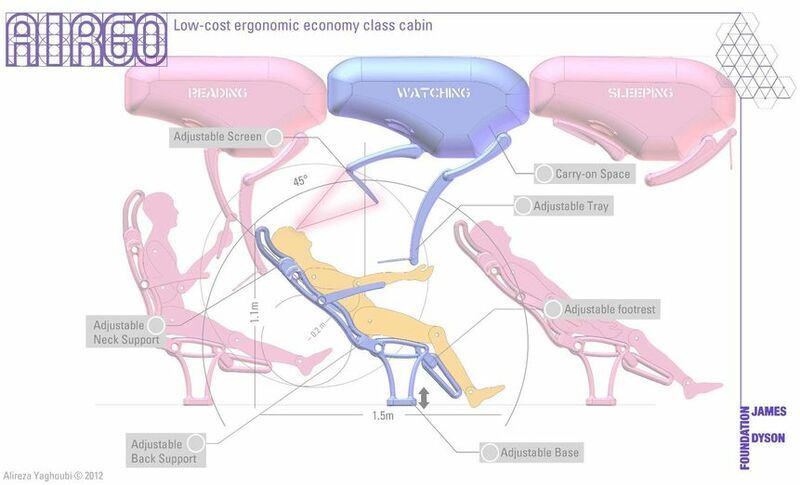 I particularly like the concept of a personal overhead locker, angled overhead inflight entertainment, and getting rid of seat cushions in favour of mesh at the appropriate tightness is a great idea. (Similar to those comfortable mesh office chairs.) 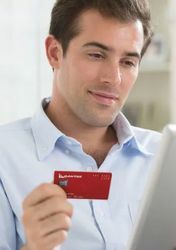 Of course, on flights where the air con is way too cold, it could get a bit chilly having airflow all around your back. And surely this would save a lot of weight for the airline to carry. Serious reduction in the amount of lugagge that can be carried. I also doubt you could fit the luggage pods at all on the window seat - remember the plane curves. Four aisles is a joke - would mean almost no galley space. I like the idea on principle especially the amount of isles in the 380 example given...would be a good safety feature if nothing else. I agree with danwarne's comments. What a horrific, horrific idea! I think we need to see a prototype set up first before we rush to judgement. Anything has to be better that what we have now - especially on crap airlines like Etihad where if your knees are not wedged against the seat in front, then there are not enough seats on the plane. Like others, I don't fancy the mesh seating, particularly on a 14 hour long haul flight. Can't quite see how the overhead lockers would work, but in theory, sounds like a good idea. Gets all the junk off the floor, if each passenger has one. But no airline is going to reduce the number of seats, specially when they are trying to pack more in - a la Etihad. So this idea will be still born. The design on the whole I guess would be better economically but theres some serious issues I have with it: Is it just me or does that tray table and tv hanging down from above make you feel like you're in a brace at the dentist? Way too cramped too, they really do need to try something else. Maybe look for inspiration in Ausbt's April Fools Joke, Project Sirius. Now that was actually going somewhere. I'm a little skeptical on the seat design but would be too quick to dismiss. One thing that does look very promising is the mesh seating surface. I've done a lot of sitting in office chairs with mesh bases and backs and, when it is done well, find it very comfortable over long periods of time. More supportive and less sweaty and without the problem of sliding down you find on the 'leather' of some economy class seats. There's definitely somethign worth pursuing there. Four aisles would be interesting in Premium Economy, don't think it would work in main economy . I would also wonder how it stacks up in an emergency situaltion . i.e. how easy and quick is it to evacuate , and all that overhead equipment falling . There would have to be alot of testing before any airline would accept this design. Good for robots - Humans - try getting the 200KG passenger into these seats and then have all of that hanging from above - very unhappy people. How does a window seat passenger get to the aisle - everyone please fold away your screens and trasy tables, stand out into the aisle and then let it all down again. Or maybe there is an electronic arm that comes and picks you up snd delivers you to the aisle or toilet?? Perhaps this idea could be marketed to Ryanair without the seats, so that passengers could stand and hold onto one of those arms like riding the subway?? Great for a seat for Ryanair. Adjust a few things - paid entertainment system, 1-2-2-1 instead, and there's a seat great for FR. Domestic first class? No way! 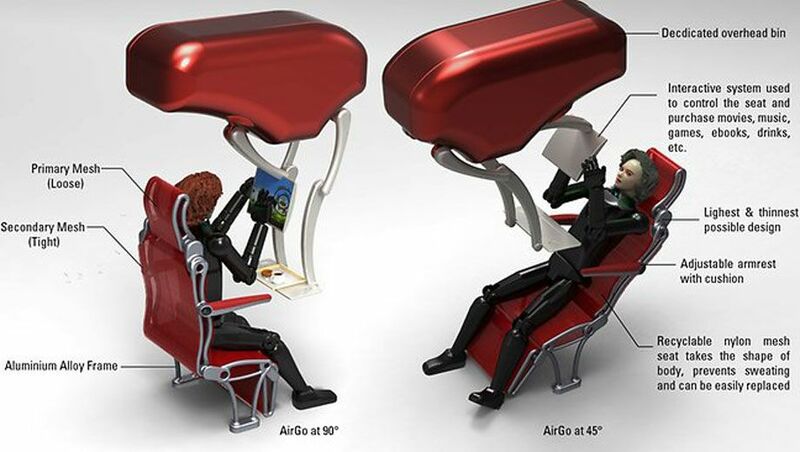 Comment on "AirGo is a radical sci-fi redesign for economy seating"